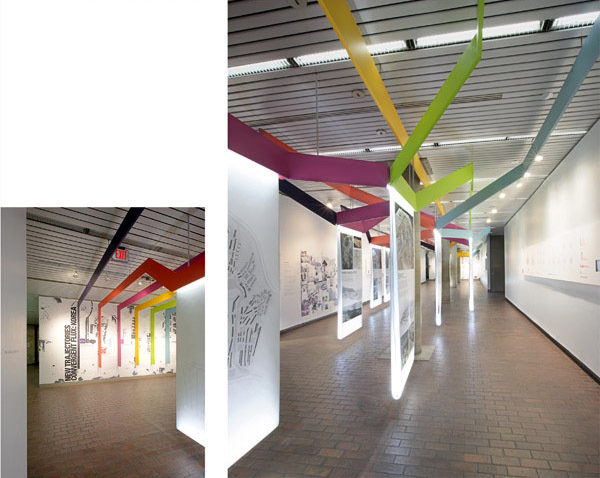 Curated by Jinhee Park, the exhibit emerged from a semester-long research project with students from the Harvard Graduate School of Design. 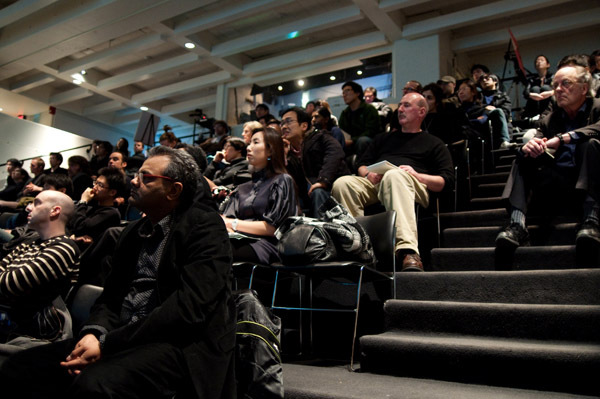 As the first cross-disciplinary exhibition on Korean Architecture, Landscape Architecture, and Urban Planning and Design mounted in the United States, the featured work exemplifies the interrelated trajectories that mark the contemporary condition in Korea: Six organizational operatives—historical transformation, accelerated density, topographical syntax, material identity, ecological intersection, and infrastructural alliance—map the individual works in a relational field. While this synthetic structure delineates the rich and specific sociocultural ground from which the projects emerge, it also provides a transferability of the concepts embodied in the work to other situations beyond the boundaries of this particular nation. Finally, these mappings allow a temporary critical pause within the accelerated production that allows us re-evaluate the work and positively shape its future evolution. The contents of the exhibit are now available in book titled, Convergent Flux: Contemporary Architecture and Urbanism in Korea. The exhibition draws from the continuously emerging and hybridized condition in contemporary Korean society that has offered such a fertile and dynamic territory for experimentation. The six trajectories converge and diverge organizing the projects in momentary relationships that open up a ground for discussion and critique. The 6 trajectories begin from the endwall: as they converge, they become both literal and conceptual intersections from which the content is structured. As the space moves linearly through the gallery, the hanging panels define ‘rooms’ where one can pause and form relationships between the projects. 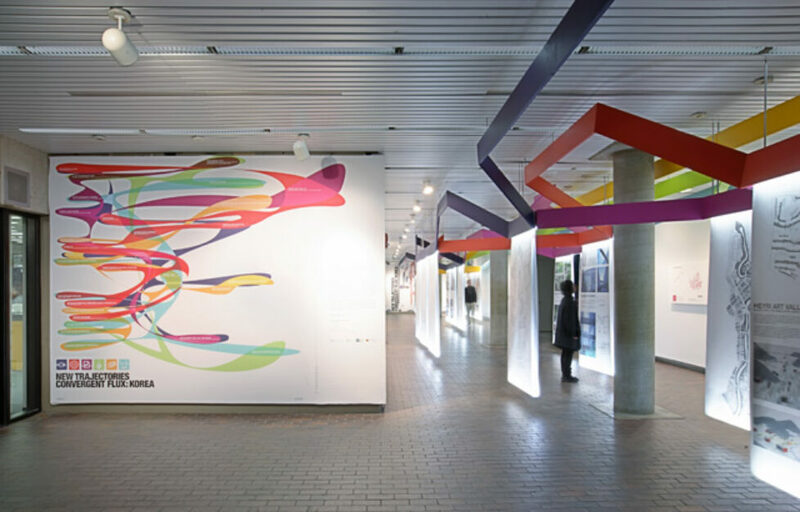 The static content on the walls become further describe each of the six trajectories. View from main entry: the project panels are first understood as a single elevation. 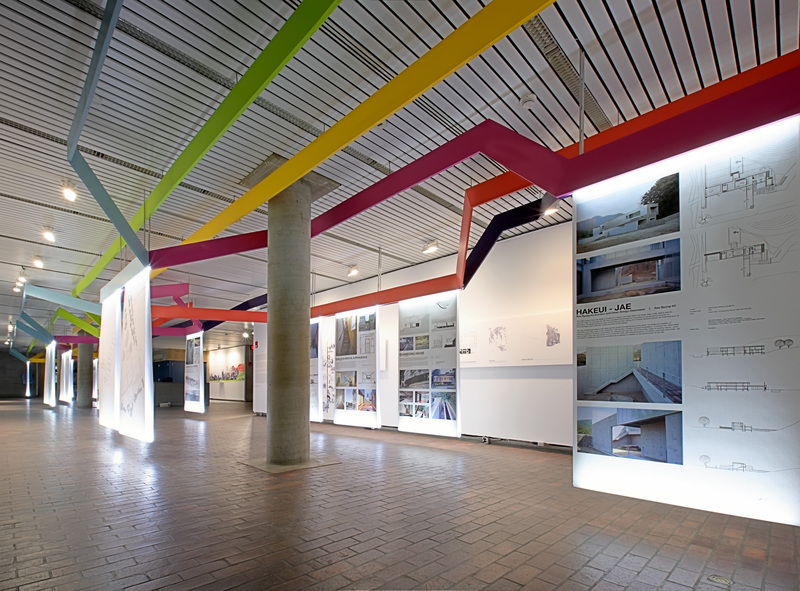 Quotes from the designers, video interviews, and data on Korean urban phenomena are placed on the walls to inform the project panels. Mohsen Mostafavi, Dean and Alexander and Victoria Wiley Professor at the Harvard Graduate School of Design, introduces the exhibit on opening night, February 5th, 2010. 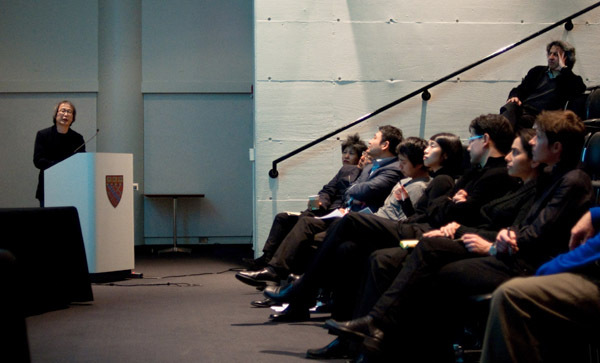 The culminating event was the symposium, ‘Convergent Flux: Extended Topographies and the Korean Urban Condition,’ in Piper auditorium at the Harvard GSD. Seung H-Sang, Pai Hyung Min, Suh Hailim, and Park Yoonjin each presented and enganged in a discussion with Jinhee Park and John Hong.